Background: Accumulating studies have indicated that the human microbiome plays critical roles in human health and disease. It is significantly important to analyze the relationships between microbe and disease, which is helpful for the understanding of disease mechanism, diagnosis and therapy. Predicting potential microbe-disease associations would not only boost understanding of the disease mechanism but also it will help to find biomarkers for disease diagnosis and prognosis. However, systems understanding of microbe-disease relationships is mostly undefined. Objective: It is important to analyze the relationships between microbe and disease, for this, we proposed a new method to predict potential microbe-disease associations. Method: In this article, we constructed a gene-disease bipartite network and a microbe-disease bipartite network based on known human gene-disease associations and microbe-disease interactions, respectively. 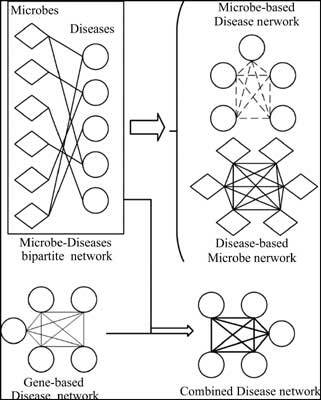 Then, a model for predicting potential microbe-disease associations was designed based on the two bipartite networks. In order to evaluate the prediction performance of our proposed method, Leave-One-Out Cross Validation (LOOCV) and K-fold Cross Validation procedures were implemented. Results: Simulation results show that our method can achieve a reliable performance with AUC of 0.8993 based on microbe-disease associations downloaded from HMDAD database and human genedisease relationships downloaded from DisGeNET database. Furthermore, it also can reach to a sound performance with AUC of 0.8640 only based on the known microbe-disease associations in the framework of LOOCV, which is clearly better than the performance of state of the art KATZHMDA model with AUC of 0.8382. Conclusion: It is anticipated that our proposed model could be used to predict more potential microbedisease associations, which is helpful for the understanding of disease mechanism, diagnosis and prognosis. Keywords: Bipartite network, similarity, computing model, prediction, microbe-disease associations. Keywords:Bipartite network, similarity, computing model, prediction, microbe-disease associations. Abstract:Background: Accumulating studies have indicated that the human microbiome plays critical roles in human health and disease. It is significantly important to analyze the relationships between microbe and disease, which is helpful for the understanding of disease mechanism, diagnosis and therapy. Predicting potential microbe-disease associations would not only boost understanding of the disease mechanism but also it will help to find biomarkers for disease diagnosis and prognosis. However, systems understanding of microbe-disease relationships is mostly undefined.